Life is a whirlwind… hold on tight! I’m forcing myself to take a break from the whirlwind of life I’m currently caught up in. I didn’t realize the 30-day blog challenge would result in me missing writing here every day but it did and I feel like I’ve abandoned my poor blog. You know what they say, it only takes twenty one days to create a habit and clearly I’ve developed the habit of writing every day. Success! Last week was a frenzy of planning and execution to celebrate Big Sister turning ten years old. We had three days of celebration in a row between our little family, her friend party and extended family party. We survived and I didn’t have much time to get hung up on how fast the last decade has flown by. Seriously, I have a ten year old? Tomorrow Hubby and I leave for Las Vegas to run our second Ragnar Relay of this year. I know I have been running all summer but at the same time I fear I haven’t trained enough. I guess we’ll see on Friday and Saturday how well I’m prepared this time around. The first time I did everything by the book and by the numbers – meaning I followed the twenty week training program faithfully. Was it beginners nervousness or my stressing about having to run twenty plus miles in two days that motivated me? Could have been a little bit of both. Now, I’m a seasoned Ragnar alumni who knows what to expect, have WAY easier runs on tap AND get to run mostly downhill – for real, this time – AND at half the elevation than I normally train in. So, I’m less stressed and haven’t been running the kinds of mileage I probably should have been since my longest run is *only* six miles. The classification of each of my runs are moderate, easy and moderate – compared to hard, very hard and hard last time. Either I’m a genius not to have been stressing all summer or I’ve set myself up for failure like an idiot. Honestly I fear it could go either way. I’m looking forward to a van full of people I know well and love and seeing a side of Vegas I’ve never seen before. Regardless of how I run, I know it will be a blast. Hubby and I are viewing it as a four-day mini vacation with a little bit of running thrown in and are looking forward to spending some quality time together while our girls spend a party weekend with their fabulous nanny. When we return, I’ll again only have two or three days to prepare for the next big thing: Halloween – my favorite day of the year. We have a neighborhood party with the kids, an adults-only party, a family party AND the school festivities all on tap BEFORE the actual trick-or-treating. I’m still sad I am not going to be running the Halloween Half with several of my friends and loved ones but there’s always next year. When I look at how crazy the last half of October is it is probably for the best that I threw in the towel on squeezing a half marathon into the mix. The day after Halloween, I’m embarking on my fourth National Novel Writing Month (NaNoWriMo) where I will *finally* emerge at the end of November with not only a win but a completed first draft of a novel. Technically I’m still working on the same novel I started back in 2008 but the only thing the same about it has been the title and basic premise. Now I have a plot structure outline, a synopsis, character studies, etc. and will hit the ground running on November 1st. I’m so much more hopeful this time around than any of the previous attempts I’ve made to write this damn novel. My intention is to blog along the way so you all can see the process but I’m not promising it will happen more than sporadically. I’ll be writing a novel – fifty thousand words – in thirty days after all! So, is it just me or has life been on a fast track lately for anyone else? 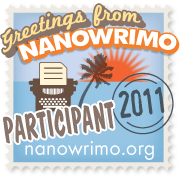 This entry was posted on Thursday, October 20th, 2011 at 3:58 pm	and posted in Everyday Life, Ragnar, Running, Writing. You can follow any responses to this entry through the RSS 2.0 feed.